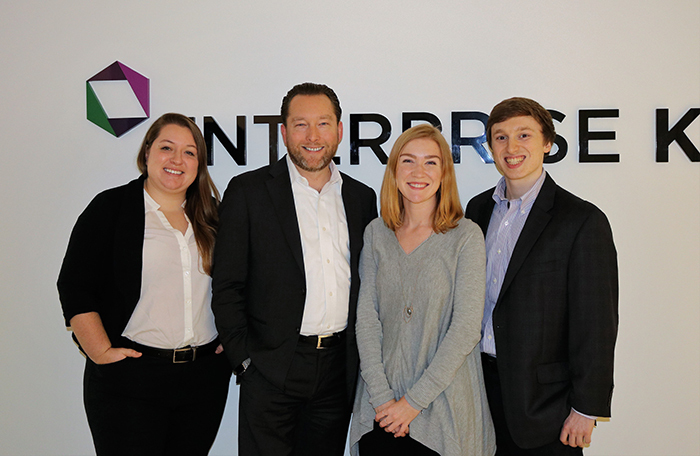 From left: Enterprise Knowledge’s Corinne Aherne ’14, Zach Wahl ’98, Claire Brawdy ’16 and James Midkiff ’17. Zach Wahl ’98 was in his senior year at Dickinson when a professor asked him if he’d “browsed the World Wide Web.” He hadn’t—this was back when the word “Google” was not yet in the lexicon, and only about 25-30 percent of American households had internet access, via dial-up. A webpage could still take a good 30 seconds to load, and newspapers and businesses were only just starting to establish presences online. Still, Wahl, fresh from his junior year abroad, was in an adventurous frame of mind. He decided to check it out. Today, Wahl is an expert in knowledge and information-management strategy, content strategy and taxonomy design. As president and CEO of a growing consulting firm, he’s tapping the skills of a new generation of forward-thinking Dickinsonians who help businesses sail ahead of the curve. At Dickinson, Wahl declared a double major in environmental studies and political science. He spent the first semester of junior year studying environmental science in Costa Rica and then enrolled in international-policy classes through a study-abroad semester at Oxford University. Back on campus, Wahl met Rick Shangraw ’81, then a Dickinson trustee, at a Career Center event, and Shangraw hired him as a senior as an environmental consultant at Project Performance Corporation. Traveling from inspection site to inspection site, Wahl saw nearly all 50 states. He also continued to learn more about the internet, and when the company launched a new division for web consulting and web design, he moved to that side of the house. Zach Wahl '98. "We have a growing contingent of Dickinsonians at the company," he says. Wahl remained at the company for 14 years, rising to the ranks of vice president, and in 2013, he partnered with a past business partner, Joe Hilger, to co-found Enterprise Knowledge, a consulting firm focused on knowledge management, software development and project management. Enterprise Knowledge has designed information systems for the National Park Service, helped bring technology to remote Indian villages and aided the Indonesian government’s disaster-relief efforts. It was named one of the Washingtonian magazine’s "Top 50 Great Places to Work for 2017" and named as Arlington, Virginia’s "Fastest Growing Business" in 2016. And the ranks of Dickinsonians at this 20-employee company are growing fast. James Midkiff ’17, a former computer-science major, brought his technical prowess and interpersonal skills to Enterprise Knowledge this past summer, and is now a developer. Corinne Aherne ’14, who studied psychology at Dickinson, joined the staff last month as a senior analyst. Megan Salerno ’18 (international business & management, English) is an intern and was offered a full-time position. Claire Brawdy ’16, a former history major, is the veteran Dickinsonian in the bunch. She joined Enterprise Knowledge right after graduation, and after seeking out and completing coursework in development and coding, she’s delivered lectures at several conferences.